The Dame Vera Lynn Trust will be celebrating its 10th Anniversary by holding a Celebration Ball at the prestigious Lancaster London Hotel. The evening will commence with a Champagne Reception followed by Dinner, Live Entertainment, Dancing, Charity Auction and Grand Raffle. Rolf Harris has kindly offered to sketch the highest bidder on the night! 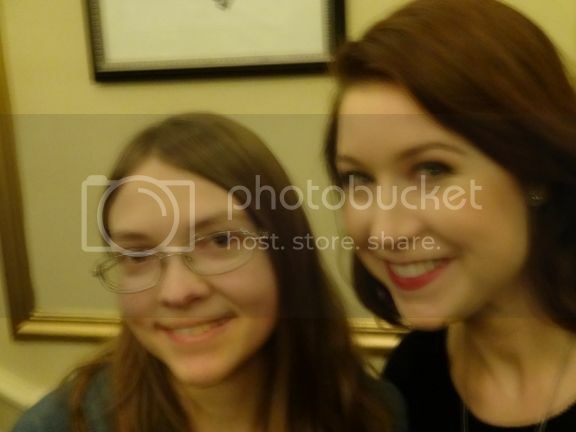 Hayley Westenra, our Vice-President will be performing for us and you can dance the night away with the Jive Aces. Tickets are on sale now at £100 per person and tables are available. Please contact the trust office by telephone or email for further information. Thanks for the information, Karsten! The Ball is a bit too expensive for me, but I've posted the details on our website with Hayley's appearance subject to confirmation. Sounds like fun! I can only imagine "dancing the night away" with Hayley singing live! Yes, I can remember a show like that with a band I was a fan of many years ago. Dancing, forget it. You just get as close to the front as possible and listen. That's waht I woud do at a Hayley "dance" too. Please note, Hayley's appearance at the Anniversary Ball has not yet been confirmed by her new management. Does this mean that her new management is working with HWI already? If so, that is good news. not replacing a confirmation by Hayley's management, of course. Hayley's appearance at the Dame Vera Lynn Trust's Anniversary Ball has now been confirmed by Sara Cox of Bandana Management. Just as well Richard as there is a full page advert for it in the concert programme for last night! Which is I believe exactly the same programme that was used at Birmingham. It certainly had that advert. Now that Hayley's appearance at the 10th Anniversary Ball has been confirmed by her management, I've moved all the relevant posts to this new thread. Today I caught up with my friends @ the Dame Vera Lynn Trust & School... The staff, the little 'uns & their parents make an inspiring team. Thought you might be interested in this article in the Spring Newsletter of the Dame Vera Lynn Trust - although I don't think it tells us anything we didn't already know. Here's the latest update from the Dame Vera Lynn Trust. Please note that tickets must be reserved and paid for by this Friday, 4th March 2011. Our 10th Anniversary Ball is now fast approaching and we have a wonderful evening of entertainment for you at the Lancaster London Hotel. Hayley Westenra, our Vice-President will be performing for us along with the Jive Aces, Swingtime Sweethearts, Victoria Yellop and the Tiller Girls. We have secured some fabulous prizes for our Charity Auction and Raffle listed below and will also have a Silent Auction of artworks from the Broad Gallery on the night. Do not miss out on this special event - please contact the Trust Office now to secure your ticket. Cost £100 each or bring along a group of friends and reserve a table of 10. Tickets must be reserved and paid for by 4th March 2011. 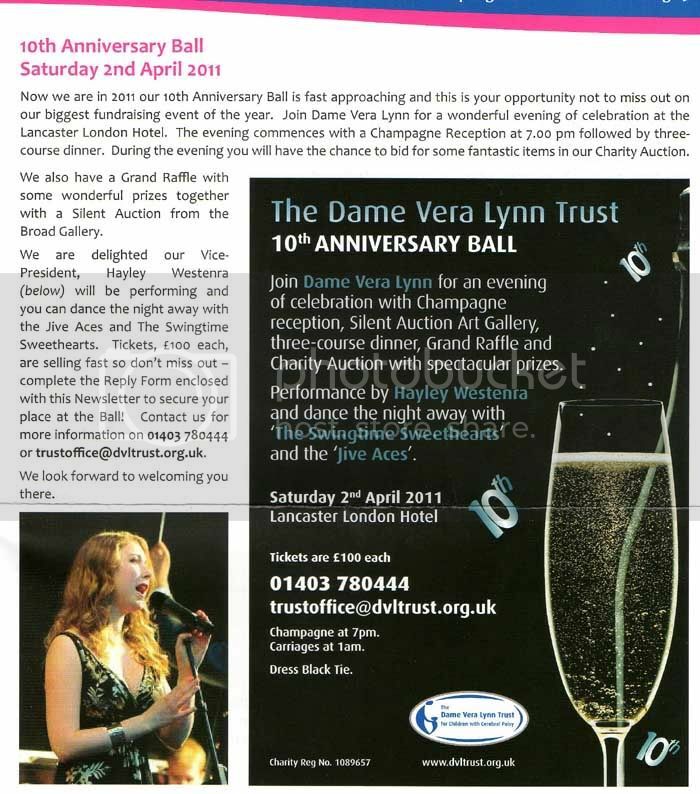 Dame Vera Lynn looks forward to welcoming you to this very special evening to raise funds for the Dame Vera Lynn Trust.